← In 2017, what ‘mountain’ will you climb? 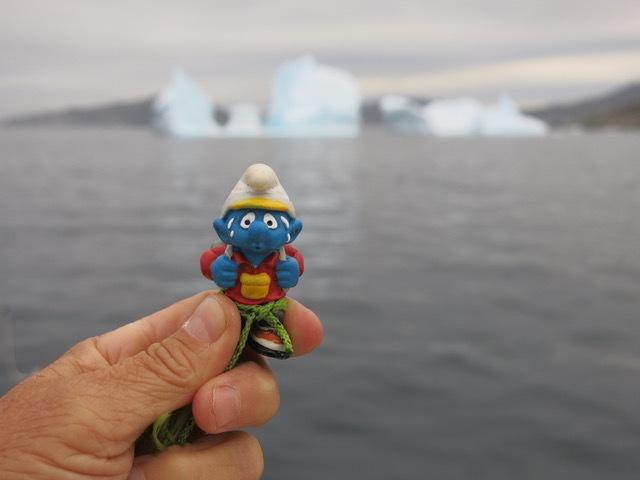 That’s my left hand holding Climber Smurf as we are traveling to Hebron, Labrador last August to begin our Paddle2Peaks expedition. It’s been a rough year for my hands. I hadn’t realized how rough until just before Christmas when I received some medical treatment that eased the pain for the first time in six months. As Joni Mitchell so aptly said, “You don’t know what you got ’til it’s gone.” I hadn’t truly perceived the level of pain until it was absent. I’m working hard in physiotherapy to keep it that way and trying to be smart and sensible about activity choices. now that I’m pain free…to stay pain free in both the short and long term. I’m going have a gnarly set of worn out hands when I’m 85 ‘cause I’m already well on my way there now. I consider my hands badges of a well-lived life. I love my hands. They are my connection to my paddle, my ice axe, my keyboard. It’s been tough to have such deep pain and doubt about that connection. Humbling too. It makes me wonder if someday that connection will be permananently broken or too painful to make. This doubt, in turn, makes the connection all the more precious and the activities I can do because of that connection, all the more precious. The new year is often an occasion for looking back over the last one, for reflection, for seeing the high peaks and the low valleys. 2016, for me and so many others, had its fair share of both. During Episode Three, Everest Air flew to Makalu to pick up a sick climber. Because the Everest Air crew was picking up that climber, they were busy when the call went out for my pick-up so I was picked up by a different helicopter and crew that also happened to be filming a series about helicopter pilots and rescues in Nepal. 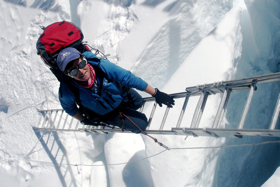 That series starts airing tonight on Discovery and is called Everest Rescue. I don’t know which episode exactly my flight will be covered in-only that it comes later in the series. As folks may remember, I often can’t watch my own media appearances. I often cover my ears and run screaming from the room when an interview comes on. I don’t often have interview remorse these days but it takes me awhile to be ready to watch or listen to myself. I have no doubt that this will be the same. The series crew captured footage in the helicopter, base camp, at Lukla, at the Kathmandu airport, at the hospital, and then in a long interview in Kathmandu the evening before I was heading home. All of that will likely be condensed into a short segment that’s mostly focused on Jason Laing, the pilot who flew me off. Of course, when you consent to being filmed/interviewed in any context, you have no idea how you will be quoted/portrayed/shown but I’m hopeful, given the way the crew treated me throughout, that they will tell the story well and with respect. I’m sure, once I gather the courage to watch the episode my flight is featured in, I’ll once again be tossed back into those moments, that day, those days, those weeks, that expedition. I’ll have another opportunity to understand the experience, its lessons, and its effects. I’ll see new connections and continue to accept/heal/let go of old ones. I’ll re-live the hope and anticipation of the beginning of the expedition and the bitter disappointment of the unexpected ending, and all points in between. I’ll see how the footage captured the moments and how that looks and feels the same (and likely different) than my lived experience of it. I’ll work with it as I’m ready and able. Those of you with access to Discovery and in the inclination to watch-enjoy! I ask that you watch it with compassion for all involved-know that I may be a few weeks or months behind in the watching-and that hands and helicopters can both be very intense life experiences understood in the looking back rather than in the moment. May 2017 bring you adventures of your choosing, teammates to share them with, and Everest sized compassion for you and all! 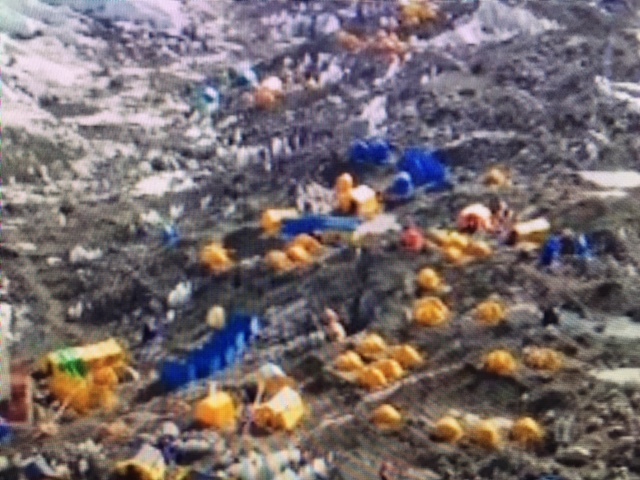 This entry was posted in Everest 3.0 and tagged 2017, climb. Bookmark the permalink. For me it has been living with a mental. illness that I believe to be a lesson about where pain can take one albeit it unnecessarily if you are at the onslaught vulnerable and strong in your belief about the Medical Model. So sure I was upon every hospitalization that they would take care of me in a humane and respectable way. It would take months to heal the trauma that occurred each time I was subjected to the fourth floor. That, I swear…upon my deathbed, is now beyond me. I am well in ways that I have not ever known. My quest though is to fight for the freedom of those within a system that is broken. Though not everyone’s pain is a gift, mine was. For that pain has shown me to be with others wherever they are on their journey. And thank you to you both for being ” there “. Thanks for sharing. Pain does come in so many ways and times. I’m grateful for my Buddhist teachings as one path in and through pain and its lessons. I read your reply. I admire your courage. I have heard of so many with the same story of a broken system. I wish you the very best! Hi TA… thank you for all the info on the show on Discovery. I will be watching. You have accomplished so much in your short lifetime and there is much more to come… wonky hands and all! I could feel some of your hesitation in watching, but it was all a great adventure that many could or would never attempt. We live vicariously through you… sickness, sudden endings, helicopter rides and all.